In Girard’s previous matchup, Mar. 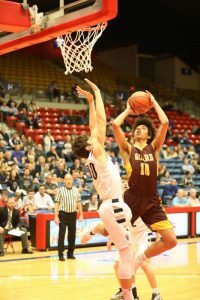 7, they were able to defeat the Kingman Eagles (17-6) 57-40 advancing to semifinal play. On Friday, Mar. 8, the Trojans tipped-off action against the (8) Thomas More Prep-Marian Monarchs as the two teams battled it out for a shot in the state championship. Off to a better start than last game, the Trojans were able to get early looks inside the paint with the senior post, Carter Doherty. Marian’s offense caught fire early in the first going on a 7-0 run after Girard’s first basket. Not phased, Girard responded back with the sibling tandem of Caleb Muia and Gabe Muia scoring 12 of the Trojans 15 first quarter points. Heading into the second, the Trojans maintained a 15-12 advantage. Muia reached double-digits early in the second quarter with the Monarchs not able to box out the explosive senior. Thomas-More struggled to keep up with Girard’s up-tempo pace as the Trojans pushed the lead to as much as 5. Attacking inside the paint, the Monarchs surged back into the game executing on free throw opportunities keeping within a distance of Girard. At halftime, the Trojans narrowly led Marian 29-28 off senior Caleb Muia’s 14-point first half performance. Girard jumped out on a 5-0 run to start the third continuing their potent inside attack. Much like the first quarter, both teams went on individual runs with the Monarchs finding their way back into the game executing off a slowed down Trojan offense. Stifling full-court pressure defense turned into transition baskets pushed the lead to 6 points and never looked back after that. A solid 22 points from Muia put Girard’s lead into double-digits, 48-27 at the end of the third. 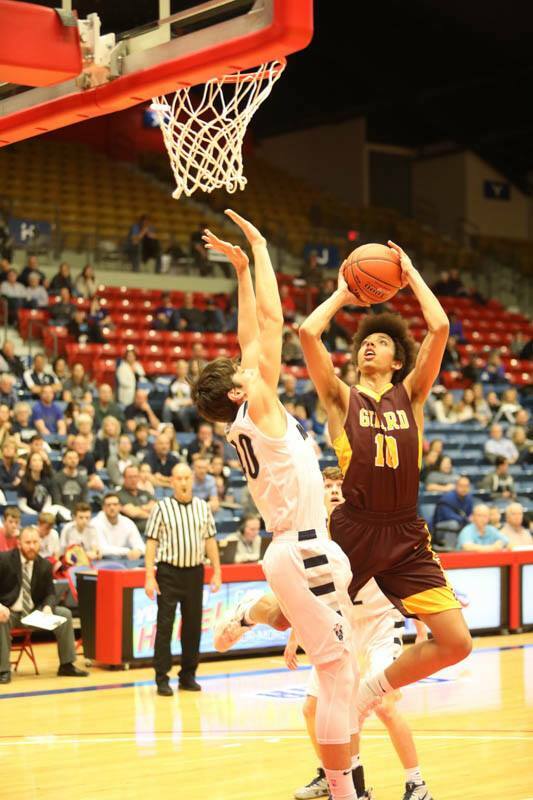 Leading by as much as 15 midway through the fourth, the Monarchs weren’t able to stop Girard’s red-hot offense as the Trojans continued to pile on the points. Senior Evan Troike threw a lob off the backboard to Muia in closing minutes of the game essentially sealing the deal for Girard as they went on to win 62-50 over Thomas More Prep. The Trojans are headed to the 3A Boys State Championship for the third time in school history behind Muia’s 33-point, 11 rebound performance. Girard will face the Beloit Trojans (24-1) tomorrow, Mar. 9, at 6:15. Junior Ryder Worrell provided a spark offensively Friday night scoring 9 points for the Trojans. Other key efforts include; Gabe Muia (8), Troike (7), Doherty (5).